This article assumes that this is your first time setting up Thunderbird. 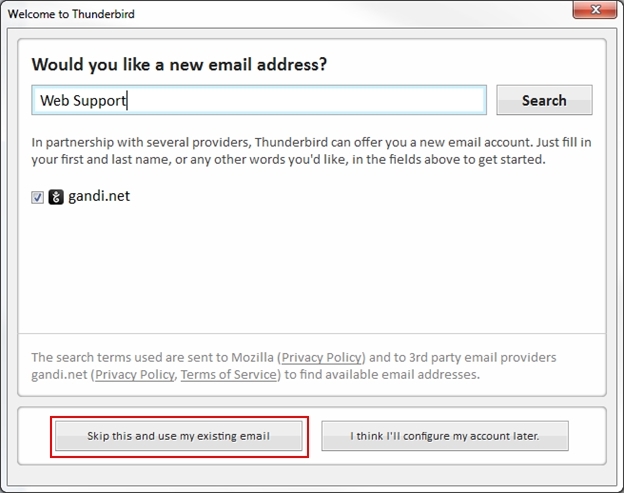 Note: If you have already set up Thunderbird with another account or made an attempt, you should do the following to get started: From the main panel, right click Local Folders > Settings > Account Actions > Add Mail Account. 1. 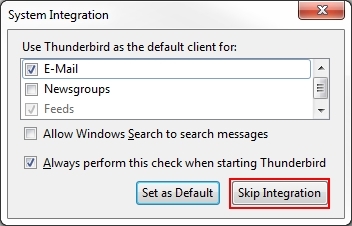 If this is the first time you have set up Thunderbird, then the following panel options appear as documented in this article. 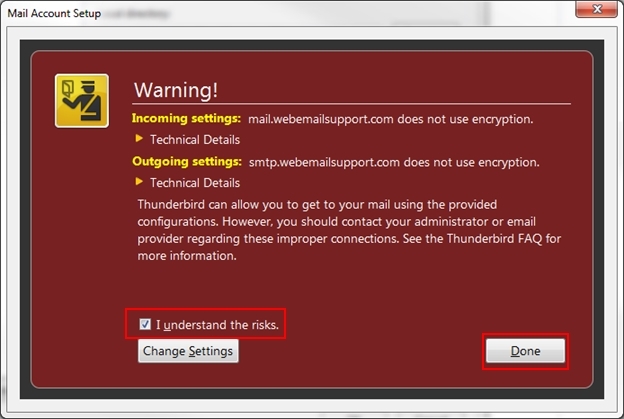 It is up to you if you want Thunderbird to scan any other email programs and automatically pull in messages from those accounts that are set up. If you are not sure, select Skip Integration. 2. The option appears to create a new email address. Click the Skip this and use my existing email button. 3. Reference the table below to enter the requested information: Your name, Email address, and Password, then select Continue. 4. 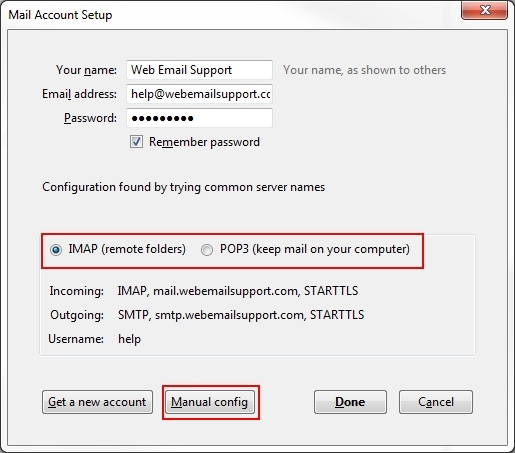 Select IMAP or POP3 and then click the Manual config button to expand the configuration options. 5. Reference the table below to enter the requested information. Click the Done button when you have finished. Note: Thunderbird will attempt to find the server settings for you. In many cases it will pull in the correct Server hostnames, but please verify they are correct by referencing the table below. Be sure to verify the Port, SSL, and Authentication settings as well. 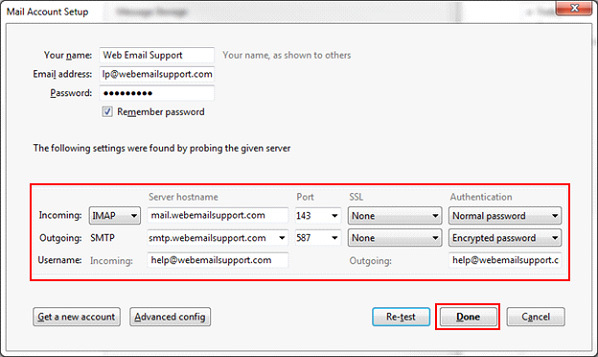 Incoming User Name The full email address of the email box that you are currently setting up. Outgoing User Name The Full Email Address of the email box that you are currently setting up. 6. A warning message may appear about not using encryption. Although, there are options to set up your connection with SSL, you may still get warnings about invalid SSLs due to the fact that the domain name is a custom domain name. Select I understand the risks, then click the Done button to complete your setup. Your email account is now set up. You may begin using Thunderbird. How Do I Set Up Outlook 2010? 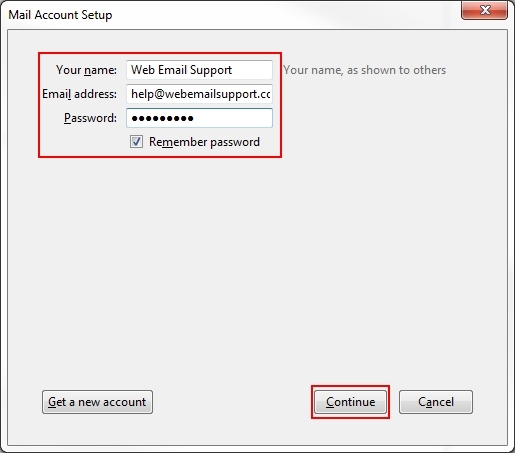 How Do I Set Up Outlook 2011? How Do I Set Up Outlook 2013?